WASHINGTON (CNS) — With students gone for the summer, campus ministries across the country focus on summer conferences and mission work and prepare for thousands of new freshmen as the fall semester approaches. 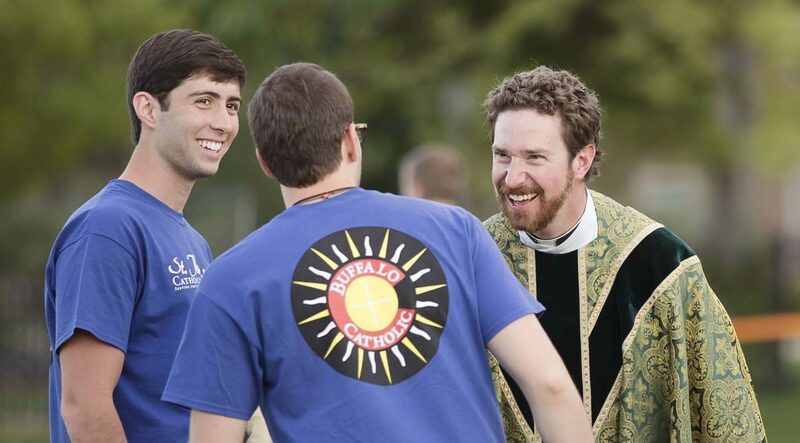 For the Fellowship of Catholic University Students, ministry spreads beyond campuses during the summer, taking college students on mission trips around the world. A national outreach program that sends missionaries to college campuses, the fellowship led several trips to Ecuador this July. Kelly Kuzma, a rising senior at the University of Dallas in Irving, Texas, traveled with the program to minister and volunteer in San Vicente, Ecuador. Kuzma, a theology major, explained that with a desire to serve but a limited time frame, the fellowship’s summer mission trip worked out well for her. After two weeks of catechesis and manual labor, Kuzma said that transitioning back to everyday life has come with its challenges. As she approached the beginning of another semester, Kuzma said the mission trip reminded her of the importance of taking time for silent prayer, both during the summer and throughout the school year. Kuzma remarked that she and other participants were struck by the realization that through their work, they were participating in Christ’s instructions to the disciples “to go out and spread his word across all nations,” as Kuzma worded it, making her eager to go on another mission trip. The group consisted of 13 participants from the U.S., four of whom were missionaries for the fellowship. Founded in 1998 at Benedictine College by Curtis Martin, the Fellowship of Catholic University Students, known as FOCUS, will have more than 660 missionaries on 137 college campuses for the 2017-2018 academic year. The fellowship’s programs — on campuses in more than 38 states and on two campuses in Austria and one in England — have engaged more than 20,000 students and an estimated 2,175 mission trip participants. Every other year, the program presents SEEK, a conference that boasts nearly 13,000 attendees. A 2009 study by the Pew Research Center found that almost 80 percent of those who leave the Catholic faith do so by age 23. As such, campus ministers are striving to find new ways to bring the word of Christ to college students. Jared Smyth, the program’s regional director for the West, stressed the importance of meeting students “where they’re at,” explaining that dynamic friendship, rather than structured programming or outreach, is often how missionaries evangelize. Smyth has been involved with the program for over a decade and helps manage several campuses from Colorado to California, working closely with the team directors that are present on college campuses. Veronica Halbur has been involved with the organization for about four years. Halbur, who did not have any missionaries from the fellowship on her campus, heard about the program from her brother-in-law, who was helping to support another missionary financially. Inspired to look into the opportunity, Halbur chose to follow the desire she had to serve the Catholic Church. “I was experiencing in college a deep longing in my own heart to encounter God’s love,” Halbur told CNS in a phone interview. Halbur spent two years as a missionary at Mount St. Mary’s University. Now a team director at Boston University, Halbur is responsible for supporting a group of five missionaries. Halbur explained that the program’s approach evangelization seeks to follow the method that Jesus displayed with the disciples: He became friends with them. “Each missionary is going to take that model of investing in students and take the idea of building up students through friendship, prayer and vision, and it’s going to become personal to who they are and who the students are that they’re working with,” Halbur said. Halbur explained that although missionaries are not allowed to approach students, if students come to them, then they can engage in conversation. “Being able to ask questions that are meaningful could launch into a discussion on the faith,” Halbur said. A cookie and a conversation can lead to shared prayer, an invitation to dinner or participation in a Bible study. During the summer, Halbur said that she and her team have continued their Bible studies on an online platform and stay in touch with their students through social media. This, she hopes, helps students to remain strong in the faith when school is not in session. Remarking that some students she knows have encountered criticism in the classroom for sharing their beliefs, Halbur said the fellowship looks to the words of St. John Paul II for inspiration: “Do not be afraid.” Missionaries strive to show students that they are not alone. During the summers, the program’s missionaries participate in training for six weeks. Smyth listed Scripture, evangelization, discipleship, Catholic worldview and fundraising as some of the main topics. The fundraising element continues after their training ends, as these missionaries are responsible for fundraising their salaries. “I think that summer training is one part boot camp, one part retreat, and I think the missionaries after learning everything in the summer, after fundraising, they’re just ready to roll on campus,” Smyth said. The fellowship’s missionaries were gearing up for the arrival of incoming freshmen for the fall 2017 semester. With thousands of new high school graduates preparing to leave home for their first semester of college in August, Halbur shared a few words of advice. Halbur said that reaching out to campus missionaries can be as easy as contacting them through the FOCUS website, https://www.focus.org, or at an event that missionaries put on at the outset of every school year such as trivia nights and spaghetti suppers.